A commitment to trees on your campus can, in turn, significantly reduce the amount of energy a campus, and community, needs to generate. Planting, and maintaining, trees on your campus and in the community reduces carbon dioxide in the atmosphere - which is one of the important roles that trees play. Learn what else you can do to reduce carbon dioxide. Green spaces give students and faculty the setting to relax with others, or on their own. What better way to study or take a break than by being outside. 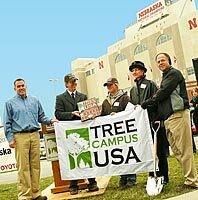 By meeting the annual standards and being recognized as a Tree Campus USA college, you will create a campus that not only benefits the environment but instills pride in the students, faculty, and community. Tree Campus USA colleges will receive recognition materials that can be showcased throughout the campus, as well as press releases to be distributed on campus and in the community.